I've dabbled in ecology over the years, including some work in forestry science. It was interesting, although I still have a hard time pronouncing "foliage." Sobieszczyk, Steven, Keith, M.K., Goldman, J.H., and Rounds, S.A., 2015, Organic Matters—Investigating the sources, transport, and fate of organic matter in Fanno Creek, Oregon: U.S. Geological Survey Fact Sheet 2015–3003, 4 p.
The term organic matter refers to the remnants of all living material. This can include fallen leaves, yard waste, animal waste, downed timber, or the remains of any other plant and animal life. Organic matter is abundant both on land and in water. Investigating organic matter is necessary for understanding the fate and transport of carbon (a major constituent of organic matter). Organic matter is necessary for maintaining a healthy ecosystem. It participates in a wide range of ecological functions, such as supplying food to the microbes that are part of the foundation of the food chain. Organic matter also plays a role in many other natural functions, including the binding and transport of some trace metals and controlling how light is absorbed in the water column. Organic matter in a stream can be found in many places, such as in the leaves that have fallen from a tree (termed “leaf litter”), in algae floating in the stream or attached to rocks, as part of the soil, or even suspended or dissolved in the water. The U.S. Geological Survey (USGS), in cooperation with Clean Water Services, recently completed an investigation into the sources, transport, and fate of organic matter in the Fanno Creek watershed. The information provided by this investigation will help resource managers to implement strategies aimed at decreasing the excess supply of organic matter that contributes to low dissolved-oxygen levels in Fanno Creek and downstream in the Tualatin River during summer. This fact sheet summarizes the findings of the investigation. For this study, we explored the amount, type, and distribution of foliar biomass that is deposited annually as leaf litter to Fanno Creek and its floodplain in Portland, Oregon, USA. 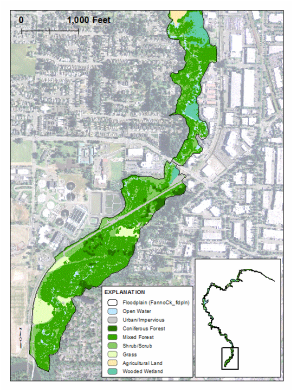 Organic matter is a significant contributor to the decreased dissolved oxygen concentrations observed in Fanno Creek each year and leaf litter is amongst the largest sources of organic matter to the stream channel and floodplain. Using a combination of field measurements and light detection and ranging (lidar) point cloud data, the annual foliar biomass was estimated for 13 stream reaches along the creek. Biomass estimates were divided into two sets: (1) the annual foliage available from the entire floodplain overstory canopy, and (2) the annual foliage overhanging the stream, which likely contributes leaf litter directly to the creek each year. Based on these computations, an estimated 991 (±22%) metric tons (tonnes, t) of foliar biomass is produced annually above the floodplain, with about 136 t (±24%) of that foliage falling directly into Fanno Creek. The distribution of foliar biomass varies by reach, with between 150 and 640 t/km2 produced along the floodplain and between 400 and 1100 t/km2 available over the channel. Biomass estimates vary by reach based primarily on the density of tree cover, with forest-dominant reaches containing more mature deciduous trees with broader tree canopies than either wetland or urban-dominant reaches, thus supplying more organic material to the creek. By quantifying the foliar biomass along Fanno Creek we have provided a reach-scale assessment of terrestrial organic matter loading, thereby providing land managers useful information for planning future restoration efforts. Lidar data and allometric equations used to estimate available foliar biomass. Biomass estimation method applied to deciduous-dominant urban riparian corridor. Annual foliage quantified for both floodplain and directly over stream. Forest-dominant reaches produce more foliar biomass than wetland-dominant reaches. Sobieszczyk, Steven, Jones, K.L., Rounds, S.A., Nilsen, E.B., and Morace, J.L., 2018, Prioritization framework for ranking riverine ecosystem stressors using example sites from the Tualatin River Basin, Oregon: U.S. Geological Survey Scientific Investigations Report 2018-5153, 40 p.
As human populations increase, so does their effect on the environment. Altered terrain, degraded water quality, and threatened or endangered species are all-too-common consequences of a growing anthropogenic influence on the landscape. To help manage and possibly mitigate these effects, researchers have developed new ways to characterize current environmental conditions and help resource managers seek solutions to bring impacted areas back to their best attainable health. However, before an ecosystem can be restored, its current level of ecological stress must be determined. This report details the development of a prioritization framework that is used to score and rank riverine ecosystem stressors in a watershed using example sites from the Tualatin River Basin in northwestern Oregon. The framework incorporates the most influential site-specific stressors throughout the basin based on past studies These stressors are characterized with thirteen metrics that are organized into four groups: hydrologic, water quality, physical habitat, and biological metrics. Waite, I.R., Sobieszczyk, Steven, Carpenter, K.D., Arnsberg, A.J., Johnson, H.J., Hughes, C. A., Sarantou, M.J., and Rinella, F.A., 2006, Effects of urbanization on stream Ecosystems in the Willamette River Basin and surrounding area, Oregon and Washington: U.S. Geological Survey Scientific Investigations Report 2006-5101-D, 62p. This report describes the effects of urbanization on physical, chemical, and biological characteristics of stream ecosystems in 28 watersheds along a gradient of urbanization in the Willamette River basin and surrounding area, Oregon and Washington, from 2003 through 2005. The study that generated the report is one of several urban-effects studies completed nationally by the U.S. Geological Survey National Water-Quality Assessment Program. Watersheds were selected to minimize natural variability caused by factors such as geology, elevation, and climate, and to maximize coverage of different stages of urban development among watersheds. Because land use or population density alone often are not a complete measure of urbanization, a combination of land use, land cover, infrastructure, and socioeconomic variables were integrated into a multimetric urban intensity index (UII) to represent the degree of urban development in each watershed. Physical characteristics studied include stream hydrology, stream temperature, and habitat; chemical characteristics studied include sulfate, chloride, nutrients, pesticides, dissolved and particulate organic and inorganic carbon, and suspended sediment; and biological characteristics studied include algal, macroinvertebrate, and fish assemblages. Semipermeable membrane devices, passive samplers that concentrate trace levels of hydrophobic organic contaminants such as polycyclic aromatic hydrocarbons and polychlorinated biphenyls, also were used. The objectives of the study were to (1) examine physical, chemical, and biological responses along the gradient of urbanization and (2) determine the major physical, chemical, and landscape variables affecting the structure of aquatic communities. CLICK ICON TO SEE PUBLICATIONS.